Seven lawyers in Ontario and the US have notified us that they’ve been contacted by the purported Michelle Seung (or Seug) with regards to a to a collaborative family law agreement dispute. This is a fraud we have seen before under several other names and similar scenarios. For details on how this fraud works and a full list of names attached to it see our Confirmed Fraud page. Child Support and Medical support, please reply to my personal email. I appreciate your swift response as per my inquiry. I would have visited your office if I was in the states but I live in south Korea while my ex spouse Hadrian Seung who is a citizen of U.S.A lives in St. George, Utah . I and my ex spouse fell in love during his UN deployment visit to south Korea 1995 and got married 1996. He is a medical practitioner for the UN. As a result of my conductive deafness it is difficult to reach you by phone, would have loved to discuss this matter on phone. I and my ex spouse agreed under a separation Agreement incorporated, merged into and made part of the court decree for a settlement of Child Support, Spousal Support, and Medical support of $781,750USD he has only paid $195,000 but still owing $586,750 and the stipulated time for completion of payment has long elapsed. This is the reason why I contacted you as there is already an agreement in place. Thus, I request your legal services to enforce the court order compelling him to remit balance owed me. kindly send me a copy of your retainer and if the terms are acceptable I will sign so we can commence the process without delay, Immediately I receive the retainer agreement I will furnish you with all documents concerning this case. We received an email from Ms. Seung back on Sept. 7. Identical to the one provided on this page (other than the reply email). Felt like a scam, good to know it is. We received the same letter and actually got a fake Chase cashiers check with the demand to wire the money to Michelle’s account. Her husband was in Huntsville, Alabama, on our document, the envelope with the check came from Canada, with a return address to a Houston, TX post office. Ironically, underneath our mailing label, we discovered a second mailing label to a firm in Texas. We called that firm to put them on notice. Apparently, they had ignored the emails, so Michelle took them off her list. I received the same scam just a few days ago. Glad to see a website helping lawyers separate the wheat from the chaff! I just got this email. Good to know that my instincts, and my spam filter for that matter, both thought this was a scam. I just got this one this morning for the first time. Thanks for the invaluable warning and information….. we received the email from her today and have forwarded the documentation to lawpro.com. We received the same thing, but she (or he…) actually filled out the “Contact Us” form on our website. I received the same letter to my e-mail using the Justia Lawyer Directory Attorney Contact Form, requesting a contempt petition. This is a fashion, lately I’ve been contacted by a few different ones and they are always from Korea or China. I received a very similar email from “Miss Seung” today. I am a brand new attorney, licensed less than 3 months, so my information hasn’t been out there for very long, and I’ve tried to avoid making my email address readily available as much as possible. The email came to me directly, not through any “contact us” type link. Glad to know my gut instincts that it was a scam were accurate. This early in the game it’s hard to ignore a “potential client”. I received the same email on Friday through the “contact us” part of our website. I received a settlement agreement and her driver’s license attached as well in the second email (no request from me for those documents). So, the scam still continues. Thank you for the warnings. I have also been contacted by this woman, with the same request. In her last email she states that her husband will be sending this cashiers check to my office next week. Thanks for the warning, got the same email , so the scam still continues. I wish to file a contempt petition against my ex-spouse for failure to makecourt ordered payments of Child Support, Spousal Support, Equitabledistribution and Medical support. Please advise if you handle such case. This week, I received three emails related to this scam. I received two emails today, almost similtaneously. One was from Michelle Seug and an identical email soliciting the same type of help came from Laurin Ichiro with the email addresses [email protected] and [email protected] Thank for the head up and thanks for all you do. Received in Alabama as well. Hadrian appears to get around a lot. Got it here in New Mexico as well. The initial email was more vague, only asking if I practiced family law and collection efforts on child support, and only after I replied did the second email reveal she was in Korea, the amount of the alleged claim and that she would not be able to speak with me over the phone because she is deaf. My scam radar kicked in and a quick search on google brought me to your site. Thanks for this website. Got it in Pennsylvania, and even got a call from the purported Hardian Seung. We got this one today. You would think that after all this time, they would atleast try another name. If you google “Michelle Seung” this is the first result. Received this as well. Initial contact came through the Texas State Bar online member directory and vaguely asked if I could enforce past due child support, spousal support and medical support. Follow up emails are same as above with ID, settlement agreement and divorce decree in one, and expect a cashiers check for full amount in one week in the other. Red flags all around, search for Hadrian Seung led me here. Got it here in New York. The trigger for me was her need to deposit the settlement proceeds into my attorney trust account. Also beware of the Scottish company looking to reach a monetary settlement with a California company. I wish to file a contempt petition against my ex-spouse for failure to make court ordered payments of Child Support, Spousal Support, and Medical support. Please advise if you handle such case. Received this via email in Charleston, West Virginia. This is the 4th time we’ve received this email (with slight changes in the message each time). advise if you handle such case. The weird thing is that I’m a law student (I still have a year to go) and the email was sent to my school account. I have no idea how the scammer would have received my email. I immediately figured it was a scam, but good to confirm. I received the email, verbatim, today in Charleston, West Virginia. Just got an email from Michelle, identical to K K’s in Washington, sent from Michelle Seung . I wish to file a contempt petition against my ex- spouse for failure to make court ordered payments of Child Support, Spousal Support, Equitable distribution and Medical support. Please advise if you handle such case. I just received this email too, is there any ethics questions if I’m messing with this person? If you are convinced its a fraud, its hard to see how there are any ethics issues reporting the names or stringing them along for more information. I have fun with them. I feel the best way to stop them is to make them waste time and money, Make them overnight you documents and print a check. Then give them more hoops to jump through before you ‘deposit’ their check. Have fun with them. March 2016, and this scam is still going on! Started getting emails and phone calls from this woman 2 days ago, under the name Alice Wang (ex-husband Yan Wang). 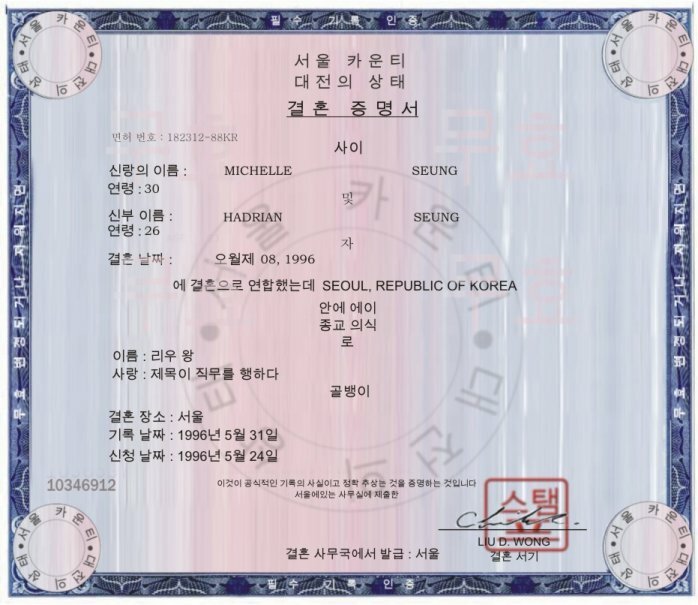 It stunk right out of the gate, but I found this website after both purported exes sent me badly doctored South Korean passports. I think I may have even found the exact image from which they were doctored. And they weren’t even clever enough to change some of the information on the altered court orders. Fun times! I received this e-mail in December 2016 right after Christmas. The e-mail has been slightly modified, but has the same basic premise as what is mentioned above. Same name as well (Michelle Seung). I was sent the e-mail 8 times in a 24 hour period of time…. Just got the same one, through a Contact Us form on the website. When I replied, I got the same response as above. Annoying. I will waste their time. Shortened email from Michelle Seung aimed to Texas Lawyer on June 24, 2017, this time using [email protected] as the return address..